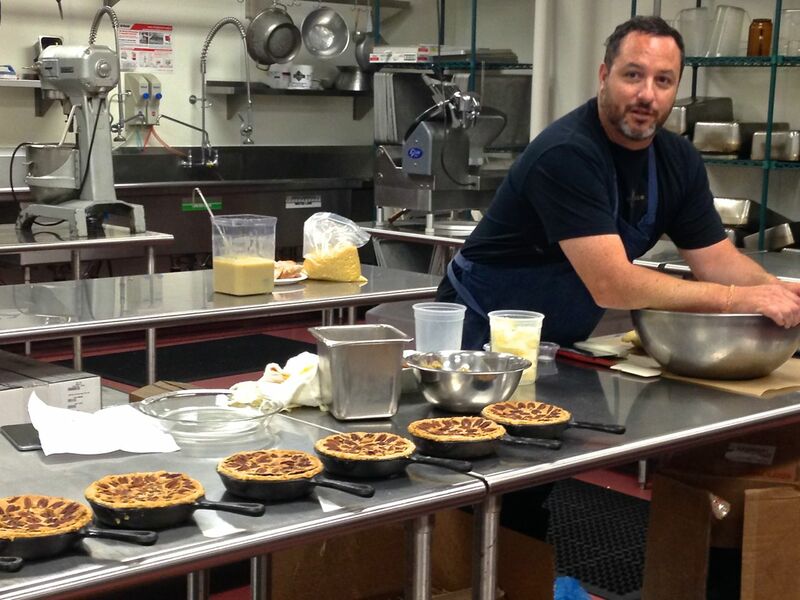 Chef Matt Gordon of Urban Solace makes this Sweet Potato Pecan Pie as an oversized, deep dish pie by baking it in a cake pan. This recipe makes enough for 2-3 regular sized pies or 7 mini pies (as pictured). 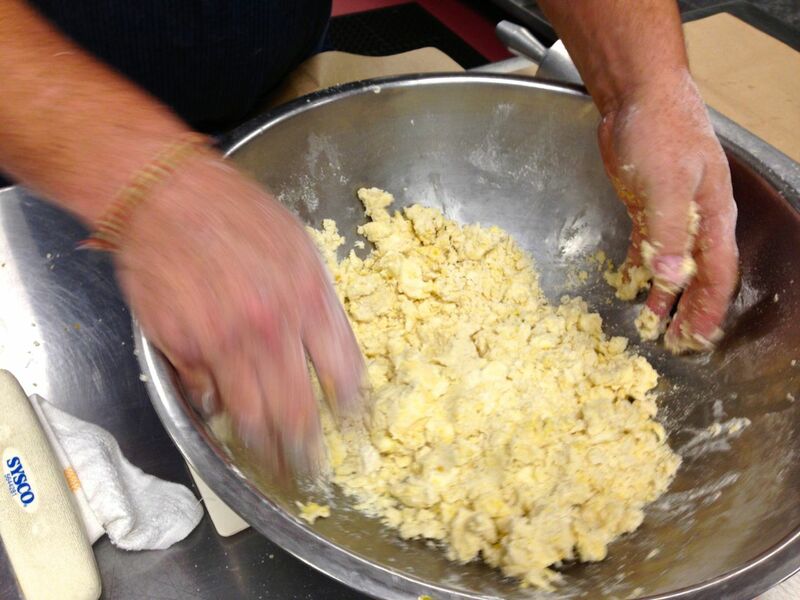 To make the dough: Sift flour, sugar and salt together. Cut in butter and orange zest until combined. Slowly add the yolk and water until dough pulls together. Ball up and chill for at least 30 minutes. For first layer, mix all ingredients in mixer for about 3 minutes or until totally smooth. For second layer, cream sugar and butter and add eggs until combined add remaining ingredients and mix for 1 minute. 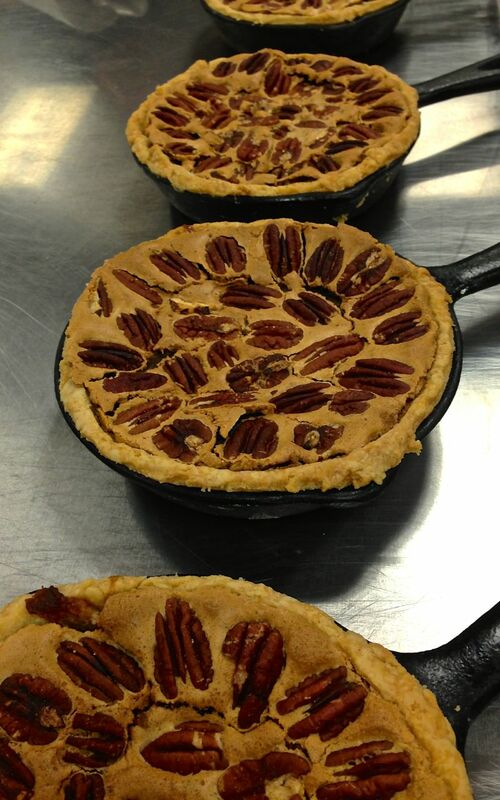 To make pie: Butter 1 large cake pan for a deep dish pie, or 2-3 regular sized pie dishes, or 7 mini pie pans. Cut a parchment circle to fit the bottom. Roll the crust out onto a floured sheet of parchment and flip into pan. Flute edges and brush with egg whites. Fill about halfway with sweet potato filling and spread 1.5 cups of hand crushed pecans evenly over filling. Top with second layer mixture until just to lower edge of crust. Add more pecans! Bake at 325 in oven for about 45 minutes or until a toothpick comes out clean. If it is browning to quickly, place foil over the top of the pie. This entry was posted in Dessert, Food, Restaurant Recreations and tagged dessert recipes, pies, Thanksgiving, vegetarian. Bookmark the permalink.